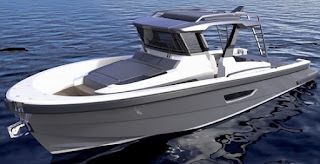 Blue Game presents the project of the BG42 new entry model to the sport utility cruiser and yachts range and replacement to the 40 model. The BG42 is based on the platform of the previous BG40 model with important new design changes added in both technical and accommodation areas, with Zuccon entering in a team along Lou Codega hull designer and Luca Santella the inventor of this concept and range of models. The important changes in the BG42 are the Volvo IPS pod drive propulsion choice versus the Cummins engines ZF pods combination of the previous model, a redesign of the hard top now featuring more aggressive looks, and an interior layout now having an open plan layout with a full beam master berth to midships. The old BG40 featured a more family friendly four plus two cabin layout with V-shaped dinette forward and two guest cabins at midships. A nice addition in the BG40 is an extended bathing platform with electronic lift making tender launching and recovery easy. The new Blue Game BG42 will be powered by twin Volvo 435hp with IPS pod propulsion with speeds estimates for the ten tons displacement up to 35 knots.